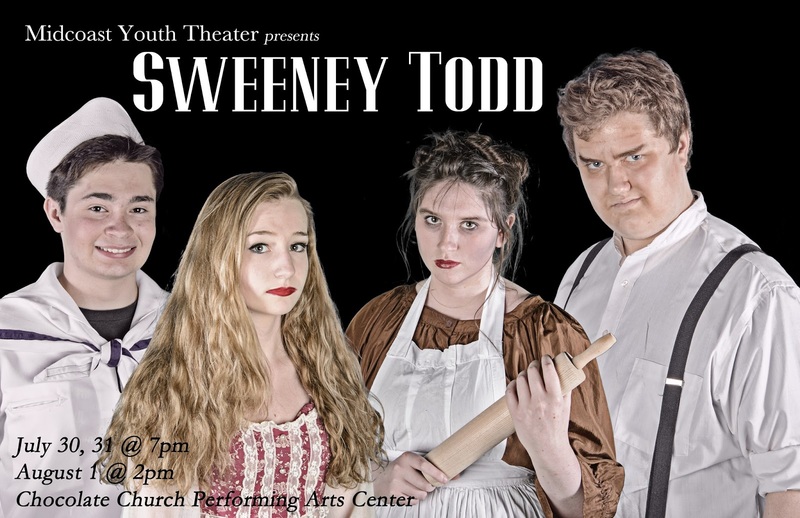 Midcoast Youth Theater presents High School aged performers in a dark and witty thriller: Sweeney Todd, The Demon Barber of Fleet Street. This is a tale of loss, love, revenge and murder told with the dynamic, chilling, and compelling music of Stephen Sondheim. It tells the tale of an unjustly exiled barber of 19th Century London when, finally able to return, he seeks to exact his revenge. Sweeney Todd (Brian Sidders) teams up with Mrs. Lovett (Emma Berkowitz), the proprietress of an unsuccessful pie shop. Unable to punish the Judge who destroyed his family, Sweeney uses his barber shop to exact revenge against any customer who walks in the door. The resourceful Mrs. Lovett discovers how Todd’s penchant for murder can provide her with a secret ingredient for her pies. Suddenly her pie shop is a success. But success is not long-lasting. The duo is stopped. While it is arguably the most macabre tale ever set to music, the depth of it’s themes are matched by the extraordinary musical score and the talent of the performers. Joining Berkowitz and Sidders are Kobi Appleby as Anthony and Kaitlyn Prophett as Joanna, as well as a talented ensemble, and a 9 person orchestra. Sweeney Todd is presented by special arrangement with Music Theater International. Music and lyrics by Stephen Sondheim, book by Hugh Wheeler, Tickets are $10 for adults, $8 for students and seniors. Recommended for mature audiences. Tickets will be available at the door or on-line at www.MidcoastYouthTheater.org. Thursday July 30th and Friday July 31st at 7:00 PM and Saturday August 1st at 2 PM at the Chocolate Church Arts Center, 804 Washington Street in Bath. FMI 207-837-8567.